Home Performing Arts Music Guitar Guitar Classes & Lessons Do I need my own guitar before I can start learning? Do I need my own guitar before I can start learning? Another popular question that gets thrown my way is should a beginner guitarist purchase their own guitar when deciding to take classes? My answer is always a resounding… YES. Let me explain: I do understand that people are afraid to cough up money and purchase a guitar. They are afraid that they might not ‘take’ to it and will end up quitting. With that being said, I’m here to tell you that in order to really give guitar playing a shot, you need your own guitar. Learning how to play is 20% class time and 80% practice time. About 20% of your guitar experience should be in some form of a classroom. Be it private tuition , online courses or books. Here you will learn all the techniques and theory that are required to master the guitar. The other 80% should be the student practicing all that material in order to really become a guitarist. As I’m sure you’ll agree, without your own guitar you’re missing out on the most fundamental part of the guitar learning process. For that reason alone, I strongly suggest that you have your own instrument. Another important factor to consider is that the student needs a guitar size and set up that suits their size and skill level. Smaller individuals would need smaller guitars and larger individuals would need full size instruments. The type of guitar is also something to take into consideration. Lastly, although not a primary reason, I do feel that getting your own guitar is also great as it helps motivate you even more to practice and succeed !! Let’s be honest , nothing motivates us more than getting a shiny new toy. Now that you know that you need your own guitar, the next question is, what guitar should I get ? I get asked this question on many occasions too. In order for me to answer this, let’s first discuss what our options are. These are steel string guitars. They produce awesome sound and have a workable neck. They are portable as they produce their sound acoustically and hence don’t need to be plugged into an amp. These are nylon string guitars. They produce a sound that is clean and warm and is in line with classical music. The necks on these guitars are generally very wide. Again it is portable as it produces it’s sound acoustically and does not need to be plugged into an amp. These are steel string guitars. As the name implies they produce their sound by means of pickups which require electricity. These guitars are not portable in the sense that you need to carry an amp and cable around. Generally they have small bodies and narrow, workable necks. Now that we have a better understanding of the options we have, let’s get into which one you should start with. If the student is under the age of about 12, I highly recommend a classic guitar. The reason for this is because of the nylon strings. As already mentioned these guitars are fitted with nylon strings, which will be a lot easier on the fingers. Learning how to play for the first time is challenging on the fingers so we want to make the process as pain free as possible for youngsters. One issue with classic guitars is the wide neck. This becomes a problem when we commence with chord playing and cover certain aspects with chords. Once young students reach that level, I generally suggest they progress into an acoustic guitar as their fingers and hands have strengthened. If the student is over the age of 12, I recommend an acoustic guitar. They produce excellent sound, are portable and have necks that are not too wide. This is especially important for students with smaller hands. The steel strings will be harder on the fingers initially. However hard work and dedication will get anyone through the initial stages of finger and hand strengthening. Fight through the pain. For students who really want to play the electric guitar, I have no issue with that. One thing to note though is that playing an electric guitar is quite a lot easier on the fingers. This is due to the gauge or thickness of the strings being a lot thinner than acoustic strings. I would therefore still suggest that these students learn on an acoustic guitar initially. This allows their fingers to strengthen considerably. After learning on an acoustic, not only will the transition over into electric be a breeze, but they will be able to play an acoustic too. I often find students who only play electric guitars struggle when transitioning over into acoustics. Why do I need an instructor? We live in a day and age where there is an abundance of freely available information. All you have to do is hit up Google and you can find thousands of videos and articles on how to do anything, including how to play the guitar. ”Why do I need to fork out money then for an instructor?” you might ask yourself. 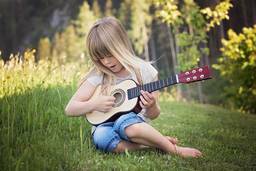 Your kids will love playing their favourite songs on the guitar! The guitar is quite simple to learn and easy to carry to school or on holidays. Your kids will be able to play anywhere, anytime.